In 2007, they recruited Laurence Kiffer from Derains & Associés - a member of the Paris Bar Council – plus various younger lawyers from well-regarded arbitration shops such as Jeantet Associés. A decade later, they added a fourth partner, Raphael Kaminsky. Well known in his own right, he had previously worked at Latham & Watkins and Lazareff Le Bars and solo. And in 2018, they added a fifth: French Iranian national Shaparak Saleh, formerly of Freshfields Bruckhaus Deringer. Teynier Pic has represented clients from industries as diverse as aerospace and defence, telecoms and fashion, on mainly ICC matters. It also handles investment treaty matters, for both investors and states. It has a particular niche for disputes from Francophone Africa. In 2016, it entered an alliance with Griffin Litigation, a London and New York-based boutique set up by Peter Griffin, once a rising star at Baker Botts and now principal at Slaney Advisors. Griffin Litigation specialises in enforcement, particularly against sovereign states. Teynier, Pic and Kiffer regularly sit as arbitrators. Teynier was on the tribunal in the famous Getma v Guinea case, which saw a clash with the OHADA Common Court of Justice and Arbitration over the arbitrators’ remuneration. The team, which also includes two counsel and five associates, are fluent in French, English, Spanish, Italian, German, Polish, Marathi, Persian, Tamil and Hindi. Clients include Orange, Thales, GE, Total, French supermarket chain Auchan, cereals trader Sougglet, Maroc Telecom (part of the UAE’s Etisalat group) and Turkish contractor Cengiz. In investment treaty cases, it has defended the Czech Republic and acted for French clients in claims against Vietnam. One of Teynier Pic’s first collaborations with Griffin was in 2016 when together they seized Equatorial Guinea’s presidential jet, a Boeing 777, reserved for president Teodoro Obiang Nguema, at Lyon airport as part of efforts to enforce a €135 million ICC award owed to Orange. Also in 2016, the team helped a Franco-Algerian joint venture win a €110 million arbitration against an Algerian state-owned oil company, over a contract to provide security for oil and gas pipelines. Their client succeeded on its claims and won enforcement of the award. Quinn Emanuel represented the other side. The team also enjoyed success for a US military contractor in a €70 million ICC case against a Middle Eastern state, over the state’s failure to pay for work done upgrading the engines of its air force. The arbitration took place in Geneva and was settled in 2016, with the state agreeing to pay all Teynier Pic’s client’s outstanding debt. In another military matter, the firm won a €40 million ICC case for a well-known French defence contractor in a dispute with the navy of a Central Asian state over an anti-submarine system. In 2011, acting for the Czech Republic, it defeated a €80 million claim by German investor Rupert Binder in 2011, breaking a losing streak for the state in bilateral investment treaty cases. It also helped a French client defeat a €325 million claim by an Alstom subsidiary over an LNG containment system in an ICC arbitration seated in London. It also won related actions in the English and French courts. The firm works regularly for telecoms clients on big arbitrations. There was a setback for Teynier Pic’s Canadian mining client Rusoro before the Paris Court of Appeal in early 2019, when the court overturned the findings on quantum in a US$1.3 billion investment treaty award the company had won against Venezuela. The firm received instructions from Turkish contractor Czengiz to bring a treaty claim worth more than €300 million against Libya. It also represented a British Virgin Islands-registered passport manufacturer in the enforcement of a US$45 million award from the Common Court of Justice and Arbitration in Abidjan, Côte d'Ivoire; the matter eventually settled. In addition, it has worked on two separate ICC arbitrations related to Africa. In the first it advised an Algerian pharmaceutical commercial agent in a dispute over the non-payment of commissions; and in the second it defended Congolese construction company Socofran against claims from a Lebanese party. Anne-Sophie Tonin, who helped the firm attach planes belonging to Equatorial Guinea for Orange, was promoted to counsel. Alongside London boutique Fietta, Raphael Kaminsky is acting for US national Vincent Ryan and his private equity firms Schooner Capital and Atlantic Investment Partners in set-aside proceedings before the French courts; their client seeks to revive a US$185 million ICSID additional facility claim against Poland that was dismissed in 2015. One client who is using Shaparak Saleh to set aside an ICC award before the Paris Court of Appeal says she has been “greatly impressed” by her intelligence and determination. Founded in 2004 by two former Shearman & Sterling and EY lawyers who had worked together for more than a decade, Teynier Pic is an international "boutique" firm dedicated to dispute resolution. Teynier Pic is an international law firm as reflected in the diversity of qualifications, experiences, personal and professional background of its lawyers. Their working languages include French, English, Spanish, German, Italian, Persian, Hindi and Tamoul. The international field is their daily workplace. 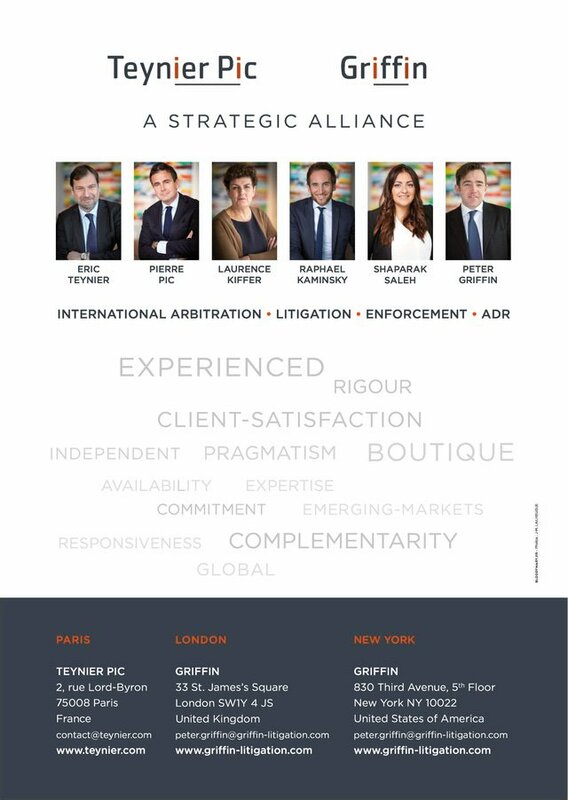 Teynier Pic recently formed a strategic alliance with Griffin Litigation PLLC, an international arbitration and enforcement boutique, based in London and New York, and founded by Peter Griffin. Teynier Pic consists of five partners, one counsel, six associates, four interns, and an administrative team based in Paris. The size of the firm makes it nimble, highly responsive and flexible in catering to its clients’ needs. Team spirit and collegiality are its hallmark. Teynier Pic is recognized as a leading international arbitration practice thanks to the wealth of experience and stellar reputation of its partners, built through a consistent track-record over the past 14 years. To this day, its lawyers have acted as legal counsel or arbitrator in more than 300 cases, involving more than 50 countries. In addition to this international arbitration practice and the arbitration-related litigation, Teynier Pic handles, along with Griffin Litigation PLLC, enforcement actions to convert awards into a successful recovery. Teynier Pic has also developed a very strong commercial litigation practice. Who Are Our Clients and What Do They Say About Us? The firm represents both domestic and international clients, including corporates, states and investors. The firm’s dispute resolution practice is transverse in nature. It has more than fourteen years of experience in the following sectors: Aviation and Aerospace, Chemical and Pharmaceutical, Construction, Corporate, Energy and Natural Resources, Investment, Banking, Insurance, Telecommunications and Defense. "Teynier Pic’s ‘super responsive’ 11-lawyer team provides an ‘outstanding level of service’, is ‘business-oriented and very hard-working’ and represents leading French companies, such as Thales, Soufflet and Orange, and international groups in commercial and investment cases. It is handling several disputes involving Africa and the Middle Eastern regions pertaining to the defence, construction and pharmaceutical sectors, but also handles some exequatur cases."